Hello everybody, sorry for the wait! Here is version 2 of our initial chapter 1 release, and fresh off the press chapter 2! There were some minor errors that we took the chance to fix up for ch 1. Thanks to Gateau for joining our team and helping us release such a great chapter from our lord and savior Asano. Huge thanks to the dedicated team for Reiraku, your determination and speed astonishes me. There is genuine passion for this project and it makes me so happy. Also can’t forget to thank Habanero for providing raws, without you we wouldn’t have been able to work on this project in the first place. Last but not least, thank you to our readers. We know you’re antsy for chapters. Just keep in mind that we’re trying to release the best possible scanlation so please have some patience. Love ya <3 Enjoy these goodies. 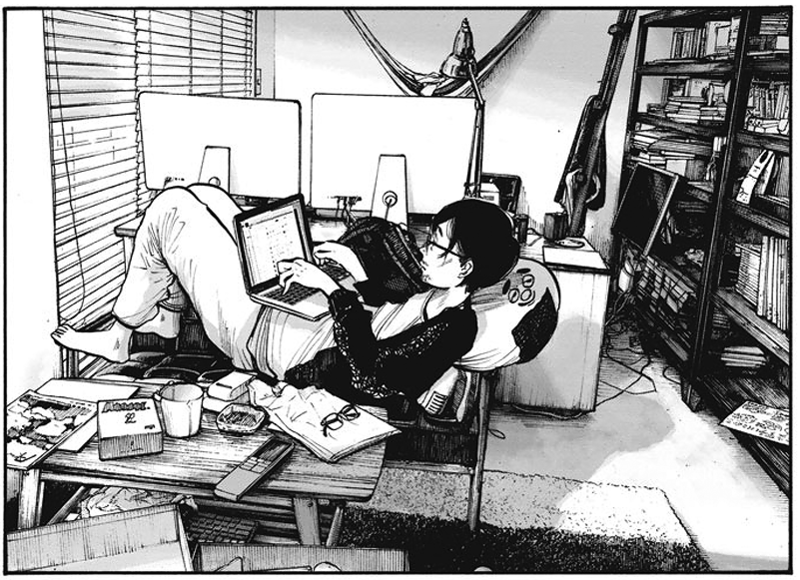 I still don’t know what to make of Oshimi’s relationship with Asano, I found that first dossier hilarious… many thanks. I’m from “Fruit Scans” we’re a spanish scanlator and I wanna tell you that we’re gonna use your version for english to spanish translation, your credit pages are gonna be on our uploads, I hope you don’t have problems with it. Thanks for bringing us Reiraku ! Hi guys, thanks for the hard work and bringing another work of Inio Assano. btw do you guys keep a clean version of the cover, I wanna use it as my wallpaper, thanks in advance. Hey, we will be including a link to download our covers in a future post. Thanks for following us! Thanks for your hard work, Dessert team! Thank you so much, glad you appreciate our work :3 Please enjoy more chapters of Reiraku. I don’t see an e-mail from you. Did you e-mail us at: dessertscans@gmail.com ? Many, many thanks for bringing us Reiraku! Normally, I only read finished manga, because the waiting time on ongoing manga is too hard to bear. But I just couldn’t resist this time and read the first two chapters several times, I feel like this is going to be great. Thank you! We are so thankful to be able to work on this beautiful series. Asano is one of my personal faves. Would you accept a partnership with a Brazilian scanlator to make Reiraku? We have cleaners and redrawers! Thanks! Thanks but we already have a full team on Reiraku. Thank you for your offer! Here’s some links to the raws if you’re feeling nice. Thank you and yes we are! Hey, are you guys doing the 3rd chapter? Yes we are 🙂 We have raws for all 8 chapters. Hey guys do you recruit cleaner for reiraku ?